3-bedroom, 2-bath Detached Home With Deck Overlooking A City Park. A cottage-style farmhouse, it includes a family-friendly open floor plan with a fully equipped kitchen, breakfast bar, dining area, and living room with a twin sleeper. The first floor includes two bedrooms, one with two twin beds and one with a king bed. The king bedroom has a patio door that opens onto the deck overlooking the nature park, bike path and playground. Not traveling with a bike? We have a stable of easy-to-ride bikes to choose from. The home has high speed internet, DISH TV, and off-street parking. A washer and dryer are located in the utility room off the full kitchen. There is a gas barbecue with serving area, utensils, and rolling cooler you can also use for day trips. The second floor includes a bedroom with a king bed, separate sitting area with twin sleeper, full bath, kitchenette, executive desk, and private deck. In the middle of Oregon horse country and on the edge of Oregon wine country, Wilsonville is within 30 minutes of the Woodburn Outlet Mall, Downtown Portland, the Oregon Zoo, Portland International Airport, the state capitol in Salem, and the Columbia River gorge. Within an hour you can be at Mt. Hood or in just a little longer, on the Oregon coast. Within 2 miles, you can walk, bike, or drive to numerous restaurants and bars from coffee bistros and fast food to sports bars, breweries and fine dining. Pharmacies, groceries, department stores, Frys Electronics, the Family Fun Center, and many more retail shops are also available in Wilsonville. The World of Speed is also located in Wilsonville for racing fans to enjoy. If you are traveling for genealogy or history, we are very knowledgeable about our pioneer cemeteries, museums, and heritage attractions. The Aurora Colony is located just 5 miles away with many antique shops and museums. One of the most recent trees to gain status as an Oregon State Heritage Tree, the R.V. Short Fir, stands just outside this farmhouse. Susan and Charlotte grew up in the other house on the property. Susan and her husband, Pat, live there with Charlotte. The three of us took on the challenge of moving this little house in order to save it from demolition. In the process we have learned a great deal about architectural restoration and we love to talk DIY with anyone who is interested! Talk about an adventure in moving! This little farm house, originally located in what is now Villebois, was slated for demolition when we decided to move it 1.5 miles to sit next to its sister house, of similar vintage and style that Susan and Charlotte grew up in. 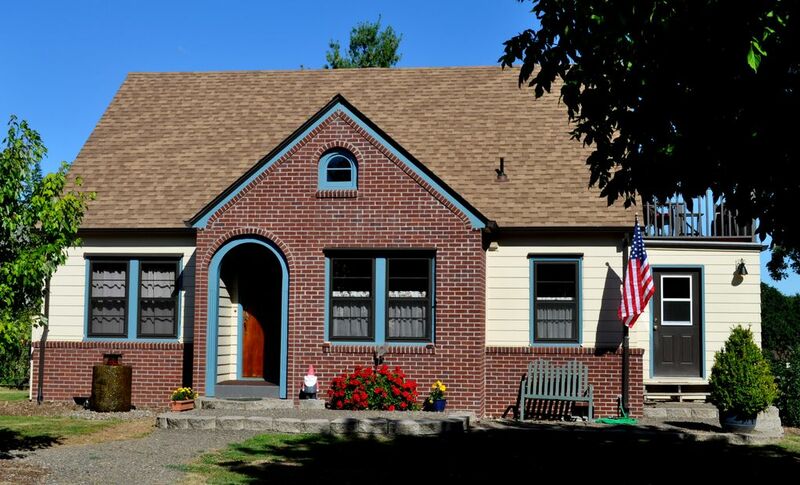 It is an example of the best of 1941 craftsmanship in a modest farm home. In the process of moving it we made the updates necessary to offer all the amenities and technology that any discerning business traveler has come to expect. If you have an interest in architectural history or renovation we are sure you will enjoy this property, but even if you do not know a salt box from a log cabin, you will enjoy the privacy, comfort, amenities, location, and access this property has to offer. Washer is available in utility room. Dryer is available in utility room. Property is on a quiet cul-de-sac with off-street parking for two cars. Living room includes a twin sleeper. Also includes three recliners for TV viewing or reading. A second twin sleeper is in the upstairs sitting area. All easy to ride, in various sizes. Large outdoor decks on three levels. Outdoor seating and tables provided. I stayed with my extended family - my 85 year old mother, 16 year old son, sister, brother-in-law and 2 nieces ages 7 and 2. This is such a comfortable house for a wide age range like we had. I appreciated the loving craft that has been put into saving and restoring the house. We were treated to some extras that were beyond what I would expect, and I really appreciated the extra time and effort given to us. Thank you for sharing your lovely cottage and surroundings. We couldn’t have asked for a more perfect place! Best VRBO stay I've had! Twin Oaks Cottage is delightful and comfortable in every way. The cottage is beautifully restored, immaculately clean, and well organized so that finding everything was easy. The location is beautiful--right on the edge of a wonderful park--and the back yard has several comfortable sitting areas, a lovely little water feature, beautiful trees! We had plenty of room to spread out, spend time all together or in smaller groups, or take a little quiet time. The owners provided clear and thorough instructions for everything, and as they live next door, communication was easy as can be! Our experience was so good that we definitely plan to come back to this lovely cottage next year. This house was perfect! We needed a two room down and Twin Oaks was just the ticket. We could not have asked for better hosts. Not only were we greeted with a cute restored farmhouse, but it came with a half dozen farm fresh eggs. You could not asked for a better equipped house, it was like being home. I should have known this experience was going to be great when I was on the web sight and a blueprint was there to show us the layout of the house. This was most helpful as we had 2 persons who needed downstairs accommodations and this was readily seen. Thanks Charlotte and family for a wonderful stay. We will be back. We always love having guests who appreciate our farm fresh eggs from happy chickens! Would enjoy having you back especially for some dryer weather. This is the second time we have rented this house while in the Portland area. It was just as great this time as last time. I would highly recommend renting this house. We loved the charm of the house, it was a perfect arrangement for our daughter’s family downstairs & us upstairs. It is in a great location, easy access to shopping & restaurants yet close enough to wine country. We would definitely stay there again! Twin Oaks is a modest 1941 farmhouse located next to a city park with a bike path connecting it to Graham Oaks Natural Area, a regional 250-acre nature park with trails and bike paths. Located just off Interstate-5 in Wilsonville, Oregon, it is convenient to the Portland metro area and the northern Willamette Valley. Cleaning and linen service can be arranged for stays longer than one week.